The UK continues to display its great entrepreneurial activity. In 2016 the UK saw a record of 80 companies being founded every hour, according to research from StartUp Britain. Many startups however never reach significant growth or struggle to scale up. According to the British Parliament, in 2017 there were 5.7 million businesses in the UK, of which 99% were small or medium-sized and about 4 million were sole traders. High-growth companies (companies with more than 10 employers that grow at least 20% over three years in revenues or employers) are very rare. According to a study conducted by the Economist, fewer than 4% of startups ever reach that status. China in turn has a thriving start-up culture fostered through massive innovation parks (e.g. Shanghai’s Zhangijang Hi-Tech Park and Beijing’s Zhongguancun Science Park), and Beijing is being touted as the new Silicon Valley. China’s domestic power and buying market surpasses the UK and Europe by large. Its 1.3 billion consumers are characterised by an extremely rapid adoption speed of new services. President Xi Jinping’s state visit in October 2015 officially launched the ‘Golden Era’ of Sino-British collaboration, which has thus far seen a constant stream of senior-level visits in both directions, as well as a number of regular, structured top-level dialogues. Great examples are the EFD: Economic and Financial Dialogue, P2P: People to People Dialogue and the Joint Economic and Trade Commission (JETCO), which handles business issues and fosters Sino-British business interaction. The Belt & Road Initiative was proposed by President Xi Jinping in 2013 with the aim of building a trade, investment and infrastructure network to connect Asia with Europe and Africa along and beyond the ancient trade routes. In early 2017 the first freight train from China arrived in London, symbolising the beginning of an international state-to-state collaboration programme for building China-sponsored infrastructure around the world. 2018 is predicted to partly comprise of rebranding existing work under the Belt & Road Initiative but will also greatly focus on delivering real projects as called upon by the central government in Beijing. UK firms can utilise the Belt & Road Initiative over the next few years to deliver projects across Asia. Finance and legal services and advanced technologies will be particularly in demand as China greatly respects the UK’s expertise in these fields. Special attention will continued to be paid to green finance, a field China and the UK are already collaborating on as co-chairs of the Green Finance Study Group formed under the G20. Given China’s fast growth and its current status as the 2nd largest economy in the world after the US, it has faced issues of great magnitude that need addressing. Above all, problems such as environmental pollution and the growing ageing population require innovative solutions. MedTech, AI and IoT experts and startups are greatly sought after and the UK has a wealth of talent in these industries. Opportunities for Sino-British collaboration are further magnified by the weakening of US ties following the 2016 election. What role does Brexit play? Post-Brexit Britain has to redefine itself as a global trading nation. The Sino-British economic dialogue, which was kickstarted by Chancellor of the Exchequer Philip Hammond, will continue, particularly with Theresa May’s planned visit to China at the end of this month. In 2016, the UK’s trade with China came up to £55 billion, making the UK Beijing’s 2nd biggest economic partner in Europe and its 8th biggest economic partner in the world. In turn China’s FDI stock in the UK has totalled nearly 13.8 billion and more than 500 companies have settled in the UK. Is China just keen on copying existing products? Absolutely not. China has in recent years developed a fierce entrepreneurial spirit. Whilst existing products might be a starting point, the aim is to take them further and innovation is highly encouraged by the government. This is evidenced by the government’s China 2030 plan to build a ‘modern, harmonious and creative high-income society’ and China’s aim to become the world leader in AI. In line with the government’s China 2030 plan to transition from heavy manufacturing to a service-driven economy, demand for imported goods is shifting across varying industries. This presents a great opportunity for startups in the service industry. For UK businesses looking to establish a presence in China, knowing the cultural differences is essential. 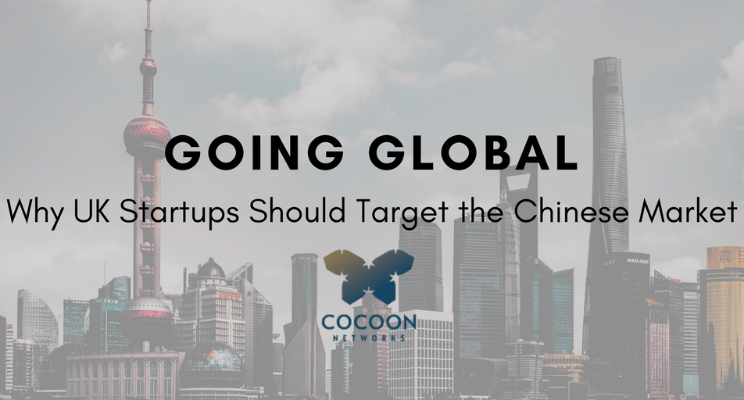 Obstacles such as the ‘Great Firewall of China’, which blocks many Western applications such as Youtube and Instagram and can block emails as well, must be considered when designing a marketing strategy. The best access points to the Chinese market are e-commerce and the service sector, including innovation and design. However UK firms currently thriving in China usually have many years of global business experience. When it comes to navigating the complex, fast-changing regulatory and political terrain, UK businesses with no previous knowledge of the Chinese market will benefit from consultancy advice or from forming collaborations with Chinese firms. Traditionally China’s strength lies in manufacturing, whilst the UK tends to impress and surpass its Chinese competitors in quality of service provision, emphasis on R&D and artistic enterprises. We believe that the UK and China should combine their respective key strengths, as Sino-British collaborations with a long-term view can bring great rewards for both parties. What to expect of China in 2018? In 2018, China will continue to focus on its ‘China Manufacturing 2025’ (CM2025) plan and Internet-enabled businesses such as AI and IoT. In recent years, China’s international reach grew through often small but regular investments. With its strong leader Xi Jinping, the Chinese government has increased centralised control and issued new regulations to successfully micromanage at sector-level. Especially online payments will be affected by the new policies, as they will now pass through a government-run clearing house. The next logical step should be increased data-protection and cyber security laws. Lastly, China will continue to excel in developing smarter cities through the use of AI on government, business and individual data. By 2020 China will most likely be entirely cashless (it already is in the majority of retail), and by 2030 it may well dominate the global electric-vehicle (EV) market. There is no better time for UK and EU businesses to play their part in China’s ambitious plans. Meet Cocoon Networks and other funders, as well as a broad spectrum of business service providers and entrepreneurs, at the Business Funding Show 2018, an all-day event on 22nd February at London’s East Wintergarden. Learn more and secure your ticket at bfsexpo.com.